It has been that time of year again. December. The dark, cold and wet winter time. At least, thats the way it is over here in Holland. For other parts of the world it can be completely different but this is the way we feel in our part of the world. 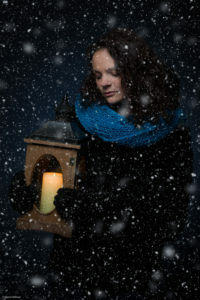 And since the weather outside was terrible, Ruby and I worked on that theme inside during a warm studio shoot. 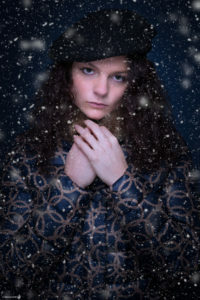 We used different clothing and props and gave it a dark and moody look that fits the winter feeling very well. We even added snow to some of the images. We used only studio flashes to create the images. A small octabox as a main light and when necessary a secondary outbox as a fill light. On the black background a flash with a gridded reflector was used. 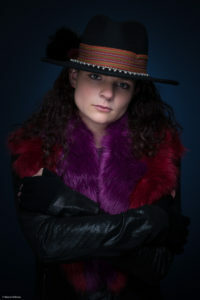 The cool blueish background was realised by adding a CTB gel to this background flash. We had a a great time and Ruby did a fantastic job to express the look of the cool, moody and wintery theme. Thanks Ruby. It was a pleasure. Heel erg mooie serie, Marco! !